Dr P had an absolutely immaculate home, except for one area - the paperwork. 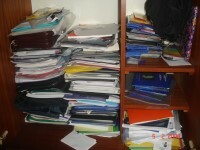 There was half a wardrobe of unsorted and unfiled miscellaneous paper. 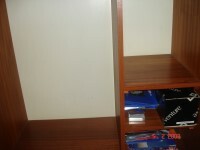 There was also some more files and paper stashed under the bed, which came out later! 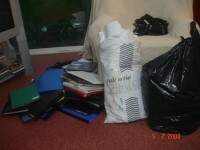 Together we spent 6.5 hours sorting, discarding and filing about four years of paper. All that is left in the wardrobe is a few packets of photographs. 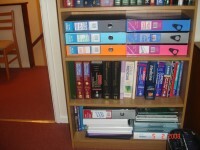 All the financial paperwork is in now in leverarch boxes which fit neatly on one shelf with some books below. The black bag went out for recycling and the white bag was shreding. The files will be donated to the stationery cupboard at work! 'It's such a relief, to have this finally sorted!' exclaimed Dr P.
To book a session contact our friendly team.